VISION MOTORWORKS Brand (NOT Generic) Guage Bezel Rings.. Fits the following vehicles: (ALL 1997-2004 Chevrolet Corvettes). Made of OEM grade matte silver ABS.. Does not create a reflective glare.. Dramatically enhances the look of your dash and gauges.. Complete with 3M double side tape, NO GLUE REQUIRED.. VISION MOTORWORKS Brand (NOT Generic) Guage Bezel Rings. Do you want to DRAMATICALLY improve the look of your Corvette's interior dash? This set of 6 bezels will do just that! They will fit ALL 1997 - 2004 Corvettes. Please look at all of the pictures so that you can see the incredible difference it makes on the appearance of your car. The bezels are very easy to install once you remove the dash. Anyone can do this with regular hand tools if they are mechanically inclined. The dash removal is a little involved so if you are not mechanically inclined, we suggest professional installation. Once the dash is off all you need to do is simply peel and stick. They come with 3M double-sided tape. I recommend that you take the time to clean and dry your dash thoroughly simply because it will give longer results and your Corvette deserves the special attention. Vision Motorworks made these bezels out of OEM quality ABS plastic, as opposed to the aluminum others use, for several reasons. 1 - Aluminum would have to be GLUED to the dash as it is not pliable and will NOT conform to the curves of the dash. 2 - Glue can and does make a mess. It can certainly ruin your dash. 3 - ABS is pliable and can easily conform to the dash for a perfect fit. 4 - ABS can also be mounted with 3M tape where the aluminum cannot. 5 - Another issue is glare. The current aluminum offerings create too much glare. The Vision Motorworks bezels are matte silver and do not create glare. These Vision Motorworks bezels are without a doubt the nicest looking, best fitting, easiest to install gauge bezels for your Corvette available anywhere. Please look at the pictures and judge for yourself. Fits the following vehicles: - ALL 1997-2004 Chevrolet Corvettes. Features: - Made of OEM grade matte silver ABS. - Does not create a reflective glare. 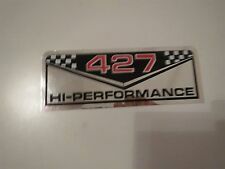 - Dramatically enhances the look of your dash and gauges. - Complete with 3M double side tape, NO GLUE REQUIRED. The Avery Name Badge Insert Refill re-supplies Avery Laser/Inkjet Name Badge Kits, so you can make professional-looking name badges with inkjet or laser printers. Ideal for meetings, seminars, special events, conventions and more, this Avery 5392 template refills are white in color. Each sheet of these Avery Badge Inserts is micro perforated to tear cleanly, leaving smooth edges. This Avery Name Badge Inserts Refill feature inserts that are 4"W x 3"L. These Avery 5392 templates come 300 to a box, making it easy to be prepared. Avery offers many easy-to-use templates for Microsoft Word and other popular software programs, allowing you to quickly and easily make name badges for events. Keep your badges protected and visible with Advantus Badge Straps with Clip. These name badge straps clip on to clothes without causing damage to the material. These ID badge straps have a neat finish and texture, and are ideal for office, school, and party use. Each badge holder with clip is made from strong vinyl. The package contains 100 Advantus vinyl badge straps. Pin style badges feature an easy-to-load pocket style design. Non-snag pin holds badge securely in place. Made from soft plastic. White, micro-perforated inserts separate cleanly leaving smooth edges. Easy to customize with free templates and designs using Avery Design & Print (avery.com/print). 8-1/2" x 11" or 4-1/4" x 11" sheets for laser and inkjet printers. #74652 contains 4-1/4" x 11" sheets. No more second guessing or forgetful blank stares — with Avery Adhesive Name Badges you get stick-and-stay simplicity. Improved flexibility makes the badges move with clothing and stick securely to fabric without curling at the corners or falling off. Plus, the peel-away design allows for quick and easy badge separation — a major timesaver when sorting and distributing badges at large events. With free templates from avery.com you can add text, graphics and logos for identifying your employees at picnics, parties, meetings or seminars. Print with your inkjet or laser printer, apply and you're good to go. Now you have a hassle-free identification solution. Flexible badges that move with clothing and won't fall off or curlAdhesive sticks firmly but removes cleanlyPeel-away design allows printed badges to separate easily from label sheet while keeping backing of each badge intact until ready to useIncludes 80 badgesEach badge is 2-1/3" x 3-3/8"
►► Belt Clip (send a message IMMEDIATELY after placing order if you prefer an alligator clip). Comes from our smoke free studio. No need to take off ID card to swipe. The Badge Shack is featuring this fun retractable ID badge holder featuring a sloth felt applique. Applique is accented with a pink and white polka dot bow. Sits on a white, hard plastic badge reel.Cord extends to 24". ►► Badge holder will be shipped with belt clip but if you would prefer an alligator clip just indicate that in a message immediately after placing order. Many thanks for looking in on The Badge Shack! Belt Clip (if you prefer an alligator/swivel clip send me a message after placing your order). Felt applique sits on a hard plastic badge reel. This retractable ID felt badge holder features a felt giraffe that's accented with a brown and white gingham checked bow. Sits on a sturdy plastic white badge reel. If you wear a uniform or are required to wear a name badge/ID badge at work and you want to add a little fashion why not accessorize with an ID badge holder? Have fun with what you wear. An ID badge holders holds your ID name tag in place without any of those old fashioned and boring strings or chains that are usually attached to your ID as you wear it. The reel extends to 24" so you can easily scan your ID without taking it off. You can fasten it securely onto your pocket, uniform, collar, necktie or belt loop. Cord extends to 24". Perfect for the student, teacher, teacher assistant or principal. Badge holder will be shipped with belt clip but if you'd like an alligator clip just indicate that in a message when ordering. Rotating alligator clip (send a message when ordering if you prefer belt clip). Mylar button - simply wipe clean!. Perfect for any professional with a badge or card!. Stand out with this beautiful name badge! These are perfect for anyone who wears an ID badge such as nurses, doctors, office staff, and educators. My badges are made using badge reels housed in a hard plastic casing and retractable with a cord length of 34". Comes with a heavy duty Alligator clip or belt clip that attaches to any part of the garment and is great for connecting to a pocket or neck line of scrubs. The swivel has a 360-degree rotation which allows you to use card readers at any height. A clear, vinyl strap with metal snap is included for attaching your unique badge to your clothes or uniform. **Badges are made standard with an Alligator clip. If belt clip is preferred, please send a message IMMEDIATELY after ordering. Belt clip (if you prefer an alligator clip send a message after placing order). 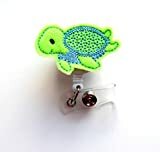 This retractable ID felt badge holder features a felt applique with a green and blue turtle felt applique. Sits on a white badge reel. If you wear a uniform or are required to wear a name badge/ID badge at work and you want to add a little fashion why not accessorize with an ID badge holder? Have fun with what you wear. An ID badge holders holds your ID name tag in place without any of those old fashioned and boring strings or chains that are usually attached to your ID as you wear it. The reel extends to 24" so you can easily scan your ID without taking it off. You can fasten it securely onto your pocket, uniform, collar, necktie or belt loop. Cord extends to 24". Perfect for the student, nurse, doctor, pharmacist, cruise passengers, banker, crafters, seamstress, conference attendees and more! Badge holder will be shipped with belt clip but if you'd like an alligator clip just indicate that in a message when ordering. Mylar covering - simply wipe clean!. Stand out with this beautiful name badge! These are perfect for anyone who wears an ID badge such as nurses, doctors, office staff, and educators. My badges are made using badge reels housed in a hard plastic casing and retractable with a cord length of 34" . Comes with a heavy duty Alligator clip or belt clip that attaches to any part of the garment and is great for connecting to a pocket or neck line of scrubs. The swivel has a 360-degree rotation which allows you to use card readers at any height. A clear, vinyl strap with metal snap is included for attaching your unique badge to your clothes or uniform. **Badges are made standard with an Alligator clip. If belt clip is preferred, please send a message IMMEDIATELY after ordering. Hidden Hollow Beads Chunky Multi Women's Beaded Fashion Lanyard Necklace, Jewelry ID Badge and Key Holder, 34 in. At Hidden Hollow Beads, we pride ourselves on creating beautiful, affordable, durable beaded lanyards for anyone needing a convenient and attractive way to keep track of keys and ID badges. Don't settle for boring work attire, dress it up with this elegant and classy beaded lanyard for your ID badge. We are committed to making sure that your purchasing experience is always a positive one and deliver outstanding customer service, every single time. We appreciate your feedback and are always working to improve our product. Should you encounter any issues with your beaded lanyard, please contact us first and let us make it right. We love what we do, and we want to ensure you love it, too. Our pretty beaded lanyards for women come in many styles: we offer cute lanyards, trendy lanyards, fancy lanyards and dressy lanyards. Click our brand name to see all of the different styles we offer. Our strong, 34" lanyards are individually crafted by real people, right here in the USA, using only the finest quality materials. The 19 strand wire is double crimped at each union, ensuring that whatever you choose to carry on your lanyard will remain securely in place, no matter what your day might bring. If your work takes you to an area where security is of concern, the breakaway lanyard will provide you with peace of mind, knowing that it will break away easily, should your lanyard be grabbed by someone or snagged on an object, leaving you free to do what you need to do. If you are more concerned with strength, being able to carry more on your lanyard, such as phones, keys, etc., please consider one of our many non-breakaway styles. Made from a felt applique. This retractable ID felt badge holder features a sunflower felt applique. Felt color is gold. Sits on a white, hard plastic badge reel. Applique measures 1.5". Cord extends to 24". ►► Badge holder will be shipped with belt clip but if you would like an alligator clip just indicate that in a message when ordering. Belt Clip (if you prefer an alligator clip send a message immediately after placing order). This retractable ID felt badge holder features a daisy flower felt applique. Bright pink and yellow are featured in this feltie. Accented with a white and pink gingham checked bow. Sits on a white hard plastic badge reel. Retractable cord extends to 24 inches. Badge holder will be shipped with belt clip but if you'd like an alligator clip just indicate that in a message when ordering. Belt Clip (send a message if you need an alligator clip). No Need to Take ID Card Off. 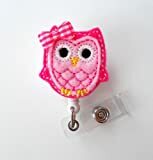 This retractable ID felt badge holder features a pink owl felt applique with an added bow. Super cute and fun to wear! If you wear a uniform or are required to wear a name badge/ID badge at work and you want to add a little fashion why not accessorize with an ID badge holder? Have fun with what you wear. An ID badge holders holds your ID name tag in place without any of those old fashioned and boring strings or chains that are usually attached to your ID as you wear it. The reel extends to 24" so you can easily scan your ID without taking it off. You can fasten it securely onto your pocket, uniform, collar, necktie or belt loop. Cord extends to 24". Perfect for the student, nurse, doctor, banker, crafters, seamstress, conference attendees and more! Badge holder will be shipped with belt clip but if you'd like an alligator clip just send us a message IMMEDIATELY after placing order. Comes from our smoke free studio. Mylar Button 1.5 " COPYRIGHT WILL NOT PRINT ON ACTUAL BADGE REEL.